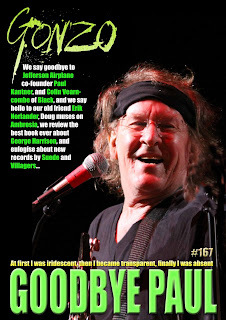 Paul Kantner who died on thursday is on the front cover together with a tribute to him inside. Jon interviews Erik Norlander, Doug interviews Ambrosia, John goes to see Nigel Kennedy, and Lee says goodbye to Colin Vearncombe. There are radio shows from Strange Fruit, Friday Night Progressive, and Mack Moloney, the latest instalment of the saga of Xtul, and columns from all sorts of folk including Roy Weard, A J Smitrovich, Mr Biffo and the irrepressable Corinna. There is also a collection of more news, reviews, views, interviews and pademelons ouyside zoos(OK, nothing to do with small marsupials who have escaped from captivity, but I got carried away with things that rhymed with OOOOS) than you can shake a stick at. And the best part is IT's ABSOLUTELY FREE!!! PLAYLIST: Strange Fruit 146 - If it Aint Stiff! ON THIS DAY IN 1606 - Guy Fawkes was executed after being convicted for his role in the "Gunpowder Plot" against the English Parliament and King James I.